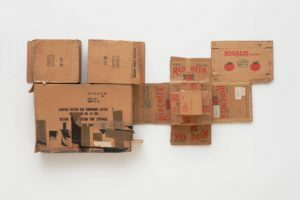 Trophy IV (for John Cage) (1961) is part of Robert Rauschenberg’s Trophy series, a group of five artworks dedicated to friends and collaborators, which the artist created between 1959 and 1962. 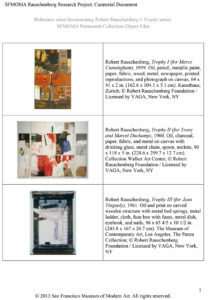 Avoiding many of the usual connotations of the term trophy, Rauschenberg described these works as expressions of gratitude, explaining in a 1999 interview conducted in the SFMOMA galleries: “[When] you wanna thank somebody back who has given you so much, then there’s a new trophy.” Unsurprisingly, the list of individuals honored by the Trophy series includes many people with whom Rauschenberg shared deep connections throughout his life: artist Marcel Duchamp (1887–1968) and his wife, Teeny (1906–1995); artists Jasper Johns (b. 1930) and Jean Tinguely (1925–1991); dancer and choreographer Merce Cunningham (1919–2009); and composer John Cage (1912–1992). 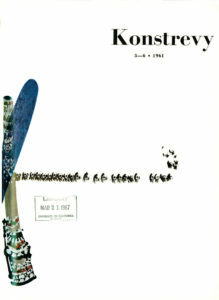 A sixth Trophy, for artist Darryl Pottorf (b. 1952), was added to the series in 1994. 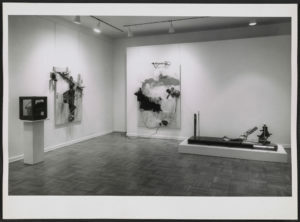 Rauschenberg and Cage met in 1951. They soon became friends and worked together frequently, particularly in the late 1950s and early 1960s, a period when Rauschenberg designed costumes and sets and Cage composed music for the Merce Cunningham Dance Company. 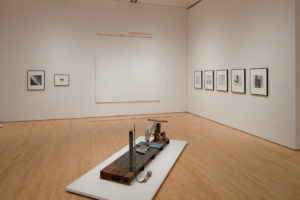 Rauschenberg considered himself so closely aligned with Cage that he later referred to him as a spiritual and philosophical soul mate. 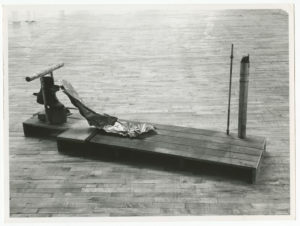 Produced in fall 1961 and first shown at the Leo Castelli Gallery, New York, in November of that year, Trophy IV (for John Cage) rests on a low wooden base that supports a variety of materials Rauschenberg found in the city streets, including a coarsely cut pipe, an antenna-like metal rod, and a large piece of crumpled aluminum sheeting. 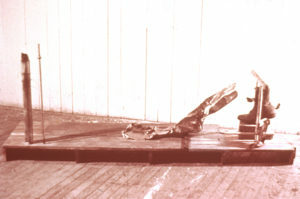 Positioned atop a strip of tire tread (likely in reference to Rauschenberg’s 1953 Automobile Tire Print, which Cage was instrumental in executing), the battered metal arcs upward, its form echoing that of the large leather boot that hangs behind it, suspended from a rudimentary wooden construction. As befits a tribute to Cage, this dynamic and slightly mischievous sculpture was conceived as a sound work, meant to be “played” rather than simply regarded. Although the boot must remain still and untouched in a museum setting, its positioning in counterpoint to the twisted aluminum invites us to imagine what would happen if it swung forward, making contact with the metal as the artist intended. 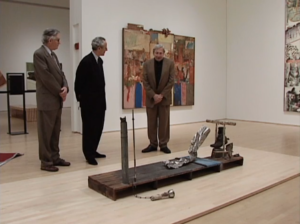 In the 1999 interview noted above Rauschenberg activated the sculpture in just this manner, repeatedly pulling the hanging boot back and allowing it to forcefully kick the adjacent metal form. 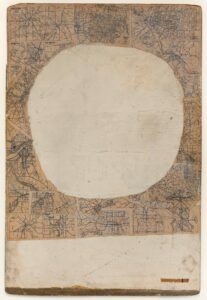 He described the discordant noise this action created as “John’s music,” referring to Cage’s radical redefinition of music to include silence and all sounds, intentional and unintentional alike. Trophies are ghoulish objects. Often erected from pillage to celebrate a victory, they are material evidence of something conquered—wild game, a culture, an enemy. Historically, they have involved the display of severed heads, hands, feet, fingers, and toes to emblematize one’s power over another.